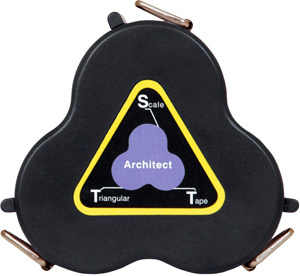 Architect Scale Tape is the new standard for scaling plans in the field or office. Once you have used a triangular scale tape for takeoffs and/or scaling in the field, you will never go back to a standard 12" Triangular rule. The best feature of the architect tape is that it has all 12 scales and reads in ONLY one direction. A standard architect rule can be very confusing to read since it has scales reading both left to right and right to left. You will have no such problem with the Architect Scale Tape. Each blade edge has only one scale. Since the clover leaf design allows for 3 tapes each with 4 edges, the architect tape is able to have 11 standard architect scales and a new 1/16 scale. Included in the Architect Scale Tape you'll find the following scales: 16, 3, 1 1/2, 1, 1/2, 1/4,1/8, 3/4, 3/8, 3/16, 3/32, and NEW 1/16. Each blade is made of metal and is two feet long. Includes Manufacturers 90 Day Warranty.